Next week marks the publication of a new biography of one of British society’s most infamous figures, Margaret, Duchess of Argyll. Our archive has proved a rich source for material on the woman who was once the country’s most celebrated debutante in her 1930s heyday. For our latest blog, we invited Lyndsy Spence, author of ‘The Grit in the Pearl’ (The History Press, 11 Feb 2019) to choose images that explore her subject’s rise – and fall. She was born Ethel Margaret Whigham in 1912, at Broom House, in Newton Mearns, Renfrewshire, to Helen and George Whigham, a self-made millionaire and chairman of the Celanese Company. In her own words, she was, ‘a very vain little girl’. Studio photographs of the infant Margaret set the premise for her future (to quote the Mitfords) ‘photography face’ – taken in profile, she had short, permanent-waved hair, a slouched posture (later known as the ‘Deb Slouch’) and a lantern jaw. The disinterested look is recognisable in photographs taken of her, as a debutante and an elderly woman, and perhaps it was attributed to what a psychiatrist diagnosed as lacking a sense of humour – ‘my . . . unsmiling face’. As a child she was often reminded, by her mother, of her shortcomings, particularly her stammer and the unsuccessful attempts to cure it . ‘No matter how pretty you are Margaret, and however many lovely things we give you,’ her mother told her, ‘you will get nowhere in life if you stammer’ It was hardly surprising that she gravitated to the camera lens; it did not capture the flaws of her personality or her voice, and the finished product, the photograph, warranted praise from strangers. ‘She always had this, don’t touch me, don’t disarrange me aura about her,’ said her friend, Moira Lester. It was as though Margaret was always picture-perfect, always waiting to be immortalised as an inanimate object. It would be dismissive to think of Margaret as little more than a woman who loved the camera. In hindsight the photographs of her offer a glimpse into the past, and into the life of a privileged woman throughout the decades, as society changed. The setting, the clothes she wore, the company she kept, are valuable source material for the social historian or casual onlooker. ‘I wasn’t aware I was rich,’ she said, and therefore she appears completely natural in the medium, not afraid to enhance her beauty with make-up or to appear well-dressed, qualities that her grandmother’s generation would have thought artificial and therefore unacceptable. It also reflects the attitude of the public, and how Margaret satisfied their curiosity for snippets of her private life, on the town, at her parents’ country house in Ascot, or skiing in St Moritz. From 1930 until 1933 Margaret had a hedonistic romantic life and was often seen with a male companion or on the arm of her latest fiancée – she was engaged to Prince Aly Khan, Glen Kidston, Max Aitken, and Fulke Warwick. As with Margaret’s preference for artifice, she did not shirk from being photographed with the men in her life – a daring stance in a society that expected a young woman to be discreet. In 1933 Margaret married Charles ‘Charlie’ Sweeny, an Irish-American stockbroker and amateur golfer, and their wedding at Brompton Oratory halted traffic for three hours. ‘No film star has had a more enthusiastic welcome from her fans than this debutante of a season or two ago,’ a newspaper reported. Two-thousand guests were invited to the nuptials, and a further two-thousand gatecrashers came to see Margaret’s Norman Hartnell wedding dress, with its star appliqués, seed pearls, and glass bugles, that were stitched by thirty seamstresses. 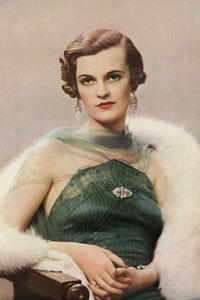 Although during her fifteen-year marriage to Charlie, Margaret thought of herself as the ‘model wife’, she continued to hold the public’s fascination and when her children, Frances and Brian, were born in 1938 and 1940, respectively, the press were invited to chronicle her family life. Mr and Mrs Charles Sweeny at the christening of their younger child, Brian at Brompton Oratory on 7 May 1940 with their daughter, Frances (later Duchess of Rutland). In 1947 Margaret divorced Charlie and in 1951 she married Ian Campbell, the 11th Duke of Argyll. Becoming a duchess gave Margaret status outside of being, to use a modern term, a celebutante, and her two identities merged to offer the public a new image: chatelaine of Inveraray Castle, her husband’s family seat in Western Scotland, restored with her father’s money, and her work in promoting the Highland’s economy. Despite being one-hundred-percent Scots, and married to a Scottish Duke, Margaret does not look at ease in what should have been her natural environment. Photographs taken during this period reflect her problematic marriage to Ian, a man dependent on alcohol, gambling, and prescription drugs, for although her signature pose remained, she looked brittle, and there was a distance between herself and the lens. Ian Campbell, 11th Duke of Argyll, together with his third wife, the former Miss Margaret Whigham and Mrs Charles Sweeny, pictured standing by a portrait of Lord John Campbell, later the 7th Duke, which they had lent for a portrait exhibition at the Royal Academy in 1956. In the mid to late 1950s Margaret was often photographed with her children, particularly her daughter, Frances. 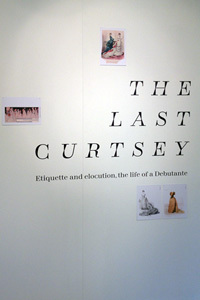 It signalled a change in the style of photograph she was accustomed to, for although the setting remained much the same, she was preparing to launch her daughter as a debutante, and for a period she became a secondary figure. Mother and daughter photographed side by side does not indicate rivalry (unlike Margaret and Helen), but a symbol of the generation gap and how photography styles had changed– Margaret, at Frances’s age, was far more intense, whereas Frances looked the epitome of a 1950s teenager. Given the controlled environment of the photograph, it therefore came as a surprise when a series of explicit Polaroids, featuring Margaret and a male companion, photographed from the neck down, and known as the Headless Man, became known to the public. They were stolen by Ian, along with her diaries and letters, and used as evidence in his divorce case, in 1963, as proof that Margaret had been unfaithful. ‘I shall spare her the indignities of what those photographs depict,’ said Lord Wheatley, the judge presiding over the divorce case. For thirty years her social record had been impeccable, and no longer was she in control of her public image, despite having taken the photographs herself. The camera, once serving to enhance her fame, later assisted in her betrayal. Margaret, Duchess of Argyll. Date: 1986 © Tim Mercer/Mary Evans. The Grit in the Pearl: The Scandalous Life of Margaret, Duchess of Argyll by Lyndsy Spence is published by The History Press .